Kelly gets one more shot at showing he’s a worthy backup to starter Case Keenum when he starts the Broncos‘ final preseason game Thursday night at Arizona. 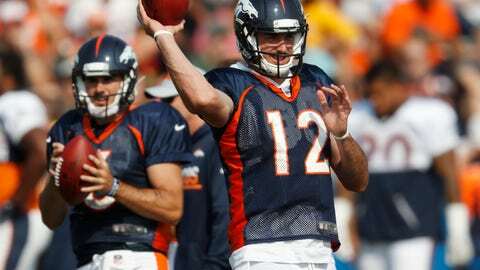 Although he’s won over Broncos fans with a stellar summer, Kelly still has to convince general manager John Elway that it’s not necessary to scour the waiver wire for a more seasoned backup QB. Lynch is 1-3 in his NFL career and has regressed this summer. Last week at Washington, he was 3-of-7 for 39 yards against the Redskins’ third-stringers. The Broncos solved one quarterback conundrum by signing Keenum in free agency, but they’re facing another as the preseason winds down. Kelly insisted he wasn’t worried about his standing, saying he’s just excited about starting his first game since lining up one last time for Ole Miss in 2016. Lynch said he wasn’t fretting over his football future, either. “I’m not worried about anything past the next day, which is tomorrow, we come out here and have our practice and then travel to Arizona and then have our meetings there. That’s what I’m focused on. I’m focused on going out and playing well on Thursday,” he said. Lynch created a bit of stir last weekend when he posted a photo on social media of a “For Sale” sign, leading to speculation he was already preparing to leave Denver.